SHELBYVILLE—A recent Saturday evening Mass at St. Joseph Church in Shelbyville was a bit different than most liturgies celebrated throughout the year at the Batesville Deanery parish. Yes, the church was filled with hundreds of worshippers, who sang with gusto. And the Eucharist was celebrated. But March 6 was also a night for the members of St. Joseph Parish to show their appreciation for the priests who serve there during this Year for Priests. Father Christopher Craig, the pastor of St. Joseph Parish, usually celebrates the Saturday evening Mass by himself. But on this occasion, he was joined by concelebrants that included retired Franciscan Father Leon Reuter, a son of the parish who is in residence at St. Joseph, and Franciscan Father Tom Fox, who assists in Hispanic ministry there. 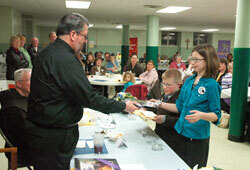 Following the Mass, a spaghetti dinner was held in the priests’ honor with approximately 300 people filling the parish’s cafeteria. During the dinner, children representing St. Joseph Parish’s school and religious education program gave gifts to the three priests. Also on display were photos and information about the 12 resident pastors that the parish has had since 1886. St. Joseph parishioner Loretta Eckstein, 81, helped put the display together. Eckstein has been a member of the parish for 75 years, and has assisted in music ministry there since she was in the seventh grade. As a result, she has worked closely with the many priests who have ministered at St. Joseph since the 1940s. It has only been during the last decade that a Hispanic ministry outreach has started at St. Joseph Parish. Father Tom has celebrated Mass in Spanish there for the past five years. He expects to end his ministry at the parish later this year. He praised the evening to honor the priests of the parish. Father Leon, who often celebrates Mass at the parish when Father Craig is away, said he enjoys being in retirement at the parish and appreciates how the members of the parish value his presence. Leigh Ann Mills, St. Joseph Parish’s business manager, helped organize the Year for Priests event and was pleased by how many people attended. Ecsktein said she hopes the event and the appreciation the parish has for its priests might plant seeds for future priestly vocations. For his part, Father Craig hopes to show the people he serves how fulfilling the priesthood is.